I've embedded myself and my two children in the neighbourhood of Gracia, in Barcelona, for a couple of weeks. We're living local in this densely-populated 'hood and loving every minute of it. It is truly a prime example of a liveable neighbourhood, with priority for pedestrians and bicycles, 30 km/h zones and the whole Mediterranean feel. 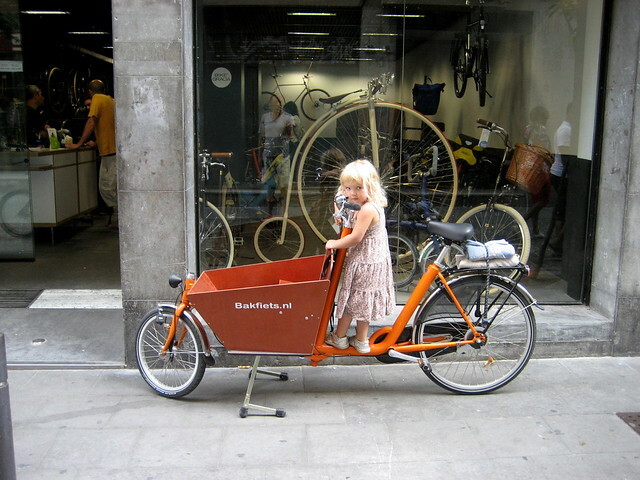 First matter of business was getting some bicycles and my good friends at Bike Gracia (formally BikeTech) have put a Bakfiets cargo bike at our disposal for the daily beach run - oh, and supermarket run and visiting friends runs. It's about 5 km to the beaches we prefer and virtually the entire route features bicycle lanes or cycle tracks. 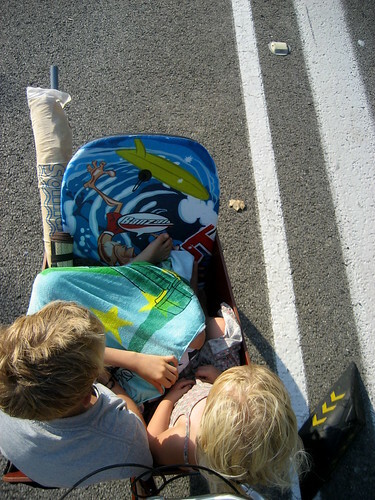 On the first couple of days the kids - and the beach gear - shared the cargo box. 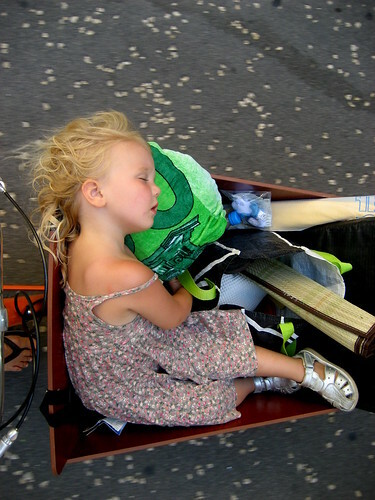 Even riding back to Gracia up the hill was pretty straightforward with the precious cargo. 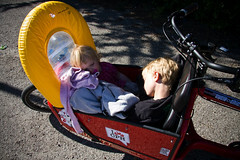 It was made a bit easier when we got Felix a bicycle of his own. 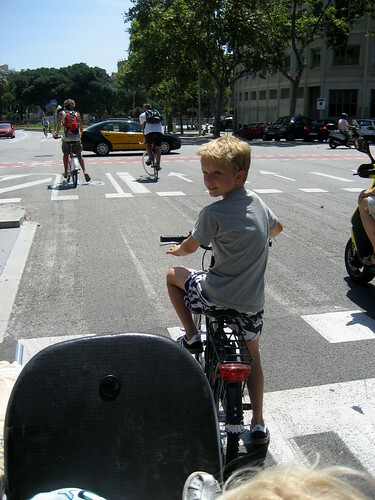 He is a Danish nine-year old after all so he's well-practiced in riding bicycles in cities. I tweeted as such yesterday, but Liveable City Requirement #1 really is being able to ride around the city with my nine-year old on safe, separated infrastructure. So far it's been back and forth to the beach each day but we do have other destinations on the agenda. And we'll need a break from the beach - it's bloody hard work body-surfing, building sandcastles, playing beach tennis and football, etc. I've ridden a Bullitt in a number of cities - including New York and Tokyo - and the stares you get from passersby are always amazing. 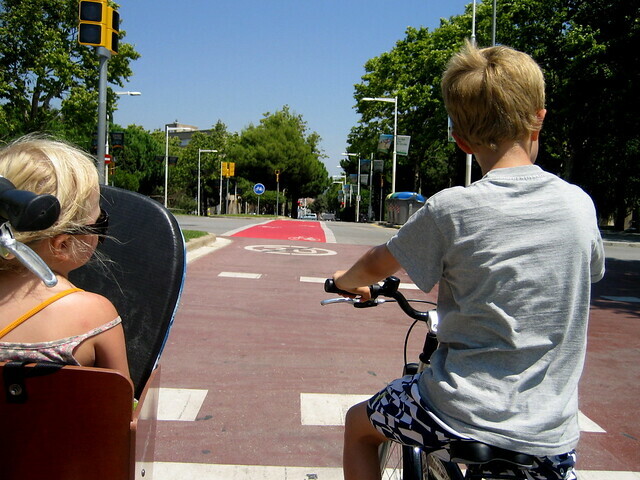 Even though Barcelona is really a bicycle-friendly city and the sight of a mum or dad with two kids on a bike with them is something you see all the time, the Bakfiets still raises eyebrows. People wave at us, smile at us, all through the city. Constanly. Lulu-Sophia thinks it's odd but we're working on getting her to wave back.